He stays some deportations even as he extends the draconian ‘se communities’. Will the real president please stand up? 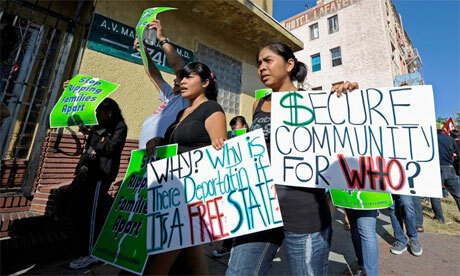 The first occurred on 5 August, when the Obama Administration announced that it would unilaterally impose its controversial deportation programme known as “se communities” (also known as S-Comm) upon every city in the United States by 2013. The announcement stunned the immigrant justice community, which had spent the last year rallying against policies in Arizona that demonstrated to the world the dangers of using the local criminal justice system to engage in federal immigration law enforcement. How can President Obama continue to portray himself as the champion of immigration reform to Latino voters, while at the same time deporting more people than any other president in United States history? Two significant announcements this month offer a glimpse into an administration that appears to be playing both sides of a bitter debate over immigration reform. Carlos Garcia grew up in Arizona and is a leader of Puente Arizona, a human rights organization seeking to improve conditions for migrant families in Maricopa County, Ariz.
Now that the Department of Justice has closed its investigation into the troubled office of Arizona Sheriff Joe Arpaio, what lessons are there from Maricopa County?